Live and let live in Lincoln « Hercules and the umpire. An English professor and a group of fellow travelers, Nebraska Watchdog.org, want the University of Nebraska to stop a tradition that started in the 1940s. That is, the release of balloons after the football team scores its first touchdown. These folks say the practice amounts to “littering” and that it hurts the environment. Taking this concern seriously (for reasons that escape me), the University Athletic Department responded. 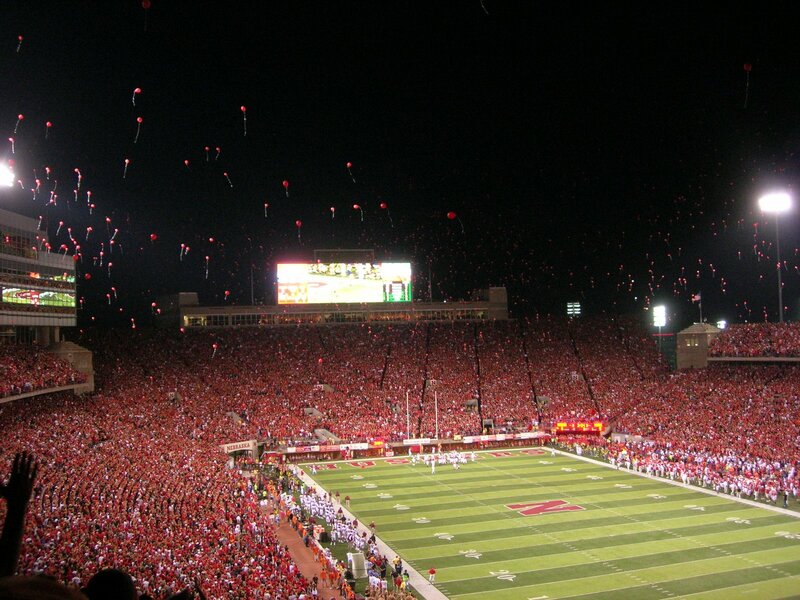 “Research shows that latex balloons are safer because they are made from organic materials that begin to break down immediately and shatter into small pieces within about three hours of release, or after rising about five miles into the air,” said Chris Anderson, director of community relations for the athletic department. “Because we care about our environment, we will continue to use only latex biodegradable balloons, cotton strings and will closely monitor research in this area,” she said. 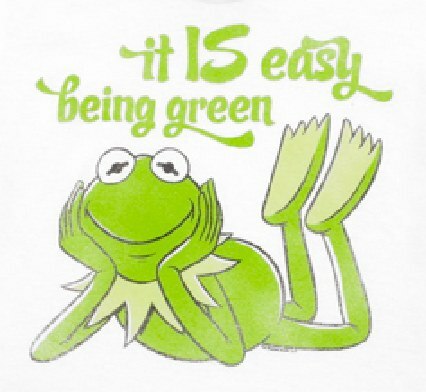 If the very earnest anti-balloon crowd promises to stop riding their foreign-made bicycles through downtown Lincoln to get to campus causing all sorts of mayhem for people who actually work for a living, the University athletic department will put a Kermit the Frog Earth Day logo on every balloon. Image credit: THE BLISS PROJECT (Earth Day). What say you English Professor and Nebraska Watchdog.org, kerfuffle settled? Or is the prospect of regular people having fun by following a long and harmless tradition just more than you can stand? Congratulations, a classic piece of Old Fart. Hope to see you at Lodge Hall. You, Sir, and the University Athletic Department are much to accommodating. The correct move would have been to double the number of balloons released, and to release a second batch on the second touchdown. We had a law professor that objected to the pink visiting team locker room at Iowa and it did not turn out well. Seriously, what was the law professor’s objection? My recollection is that she thought it was sexist. The original intent was to get on the opposing teams nerves and in some cases that worked. Well, if you’re going push buttons, it helps if something happens when you push. The Celtics weren’t that subtle–the heating in the visitors’ locker room in the Garden just had a tendency to fail. Congratulations to your undefeated Huskers! This should be a Lee Corso moment for your team. When Corso was the I.U. football coach, in 1976, he called time out in the second quarter. The team had a photograph taken with the scoreboard showing – Indiana 7, Ohio State 6. It was the first time in 25 years that the Hoosiers had led the Buckeyes. (I.U. lost the game.) I guess Corso was way ahead of his time with the now-universal use of selfies! My Dad, a loyal Hoosier, loved that story. You can understand why the Hoosiers were so thrilled with their victory last week. This week – back to reality. So – enjoy the Big Ten and the glory you can get whenever it comes your way. There was a protest this year at homecoming. Professor was a look-see visitor who wound up at Western New England the last time, this time communications type. People from the East do not understand the religious character of football in flyover country.. Asking Iowa to change a tradition Hayden Fry started was treated as sacrilege. A better argument for not releasing balloons would be the expenditure of irreplaceable helium. The latex balloons return to dust. The helium returns to the stars. That said, may your tradition continue. Why can’t they just give it a rest? Is your question addressed to me? If so, give me some context for it, and I will try to answer it. By “they” I meant the Greens. The balloons are harmless. Same deal with global warming. Just leave us alone. Flat global temps for 17 years but they have been predicting the end of the world for about two decades. The Greens either don’t put a date on the end of the world (every con man knows that) or the date is so far out in the future that we will forget. In the meantime we get gouged on green energy schemes that directs money to their friends. About two or three months ago some French minister put a date certain on the end of the world. That got buried. Google it. As a matter of law, fraud can never be premised on a future event. But this whole global warming/ climate change thing is the biggest scam in history. Two things convinced me. The leak of the British emails showing the “cooking” of the numbers and rebranding of global warming to climate change. Hot? Cold? Whatever. We’ve got it covered. The numbers and facts don’t support their dire predictions. It is a religion with them. And how about the use of the word “denier?” The only other popular use of that word was the historical fact of the murder of 6 million Jews. Big, big difference between a past event and predictions about the future of global climate at some date not stated. By the way, my son Keller is an academic biologist. He is a believer in global warming. I, too, after may years of skepticism lean that way now. That said, the politics of global warming is what bothers me. China and India won’t cooperate and Brazil is probably unwilling to do so too. I am not willing to pay a lot more money to make up for the past “sins” of this country and other developed nations in doing what any rational country what have and should have done to raise the standard of living for their peoples. That China, India and Brazil are late bloomers is their problem, and not ours. Grumble, grumble, grumble goes the old man. I have heard of the helium shortage issue, but don’t know what validity it has. I suspect that helium production is not trivial, otherwise the Germans would have used helium for their zeppelins in the 1930’s, when it was apparently unavailable to them, and avoided the Hindenberg disaster. I don’t expect that ballon “litter” is as much of an issue in parts of the country not near the coasts, but I sail offshore and see a surprising number of partially and mostly deflated mylar ballons floating in the ocean. I have been told that sea turtles, whose major food source is jellyfish, will eat them thinking that the ballons are jellyfish. This does not end well for the turtles. I don’t see latex ballons offshore, for what that is worth. I am a law student in the final year of my studies in India. Initially, I followed your blog only out of curiosity as to how the American judicial system worked, but over time I have been hooked to your fascinating and uniformly insightful posts on your life as a federal judge. If you admit that global warming is a problem, your stand on first world nation responsibility (which I understand is held privately) strikes me as carelessly ignorant. Simply, if the first world benefits today from the industrialisation it underwent, it must also bear the bulk of the cost of undoing the pollution damage it caused in order to preserve the earth for future generations. I believe you benefit from the raised standard of living in your country. If so, you must also be willing to ‘pay a lot more money’ for the pollution that enabled that raised standard of living. India (and China, and Brazil) of course have their part to play in reversing global warming. But to deny them the chance to act as ‘any rational country… have.. done’ is unfair. That China, India and Brazil are late bloomers is our problem. But it is also yours. As my environmental law professor would put it, common but differentiated responsibility. Come on, this is ridiculous. Why is it always America on the Cross? Judge Kopf, did you get to see any video of the appearance between Chief Justice Roberts and Judge Riley a couple of weeks ago. What a treat to see two actual jurists discussing the law and how they work through the issues that appear. Congress, politicians in general, and the public drive far too much discussion of “liberals” vs. “conservatives”, to the detriment of our country. We need to listen to jurists like you, Judge Riley, Judge Bataillon, and so many others in the NON-elected Federal Judiciary. First, I must apologize for my flip statement that prompted your thoughtful comment. Second, I do not begrudge India, China or Brazil in behaving like rational actors. Third, American politicians, who view the climate change debate in near religious terms, shy away (and some almost violently) from solutions that would reduce global warming while not shifting huge costs to American taxpayers–think nuclear energy and natural gas. Fourth, America should help developing nations develop cleaner energy (and otherwise) because it is in our national interest and not because of some misplaced quasi-moral argument that we owe others for our alleged profligacy. In other words, I endorse a realpolitik when it comes to the global warming problem. Hard bargains and clear treaty language may help reduce global warming, but sanctimony on our part or anyone else’s will likely produce very little. I sincerely appreciate your engagement. I hope you comment again if you see something stupid that I write (a not infrequent problem when I give in to frustration) or simply when the spirit moves you. Thanks for your comment. Whether you should listen to me is debatable, but there are a lot of federal judges–Riley and Bataillon among them–that are worth listening to if only because they think and write clearly and in civil terms even if one is not inclined to agree with them. They listen to others too, a truly refreshing quality. Begging to differ, Judge, with your marginalization of bikes as transportation. While I am sure you intended nothing of the sort, this kind of sentiment is also expressed by hillbillies in F150s who throw beer cans at law-abiding cyclists. I don’t like F150s either. All the best.